The Renaissance in Italy continues to exercise a powerful hold on the popular imagination and on scholarly enquiry. This Companion presents a lively, comprehensive, interdisciplinary, and current approach to the period that extends in Italy from the turn of the fourteenth century through the latter decades of the sixteenth. 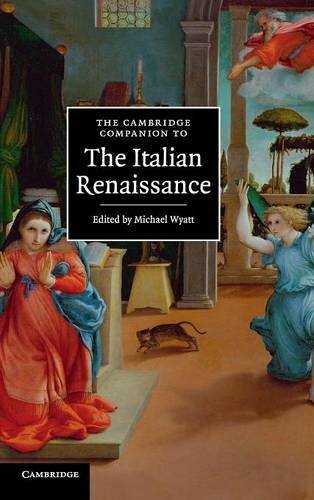 Addressed to students, scholars, and non-specialists, it introduces the richly varied materials and phenomena as well as the different methodologies through which the Renaissance is studied today both in the English-speaking world and in Italy. The chapters are organized around axes of humanism, historiography, and cultural production, and cover a wide variety of areas including literature, science, music, religion, technology, artistic production, and economics. The diffusion of the Renaissance throughout Italian territories is emphasized. Overall, the Companion provides an essential overview of a period that witnessed both a significant revalidation of the classical past and the development of new, vernacular, and increasingly secular values. An interdisciplinary collection of essays addressed to advanced undergraduate and new graduate students, non-specialists, and scholars in need of a comprehensive, up-to-date overview of a period that witnessed both a significant revalidation of the classical past and the development of new, vernacular, and increasingly secular values.